→ Clear Detox - Hormonal Health: This is Clear Medicine's formula to assist with liver detoxification and the removal of excess hormonal waste, particularly toxic estrogen, which can lead to weight gain or prevent weight loss. Clear Detox - Hormonal Health is also very helpful for PMS, uterine fibroids, fibrocystic breast, acne, fat gain around the hips and thighs (pre-menopausal women) and abdominal fat (men and post-menopausal women). → Clear Metabolism - Thyroid Support Formula: Formulated by Clear Medicine, is a unique and extremely effective hormone-free formula that contains key nutrients for supporting and regulating thyroid function. Proper thyroid function is essential for the overall healthy function of the nervous, musculoskeletal, and cardiovascular systems. Key ingredients in this formula such as L-tyrosine and Ashwagandha, and minerals such as zinc, iodine, and selenium are essential for healthy thyroid function as they are required for the intracellular conversion of T4 to T3 and optimal thyroid support. Clear Detox - Hormonal Health (Clear Medicine): Ingredients: Inositol 200mg, Choline 200mg, Betaine HCI 25 mg, Dandelion 15mg, Milk Thistle 15mg, Artichoke 15 mg, Vitamin B1 55 mg, Vitamin B2 55mg, Niacinamide 200mg, Vitamin B6 55mg, Vitamin B12 100mg, Folic Acid 400 mcg, Biotin 200mcg, Vitamin B5 55mg, Turmeric 150mg, Green Tea 200mg, DIM 100mg, Broccoli Seed Extract 15mg, Calcium D-Glucarate 400mg, Magnesium 200mg. Contraindications: Do not use if pregnant, breastfeeding, have high blood pressure or severe liver impairment. Finally! Your answer to the age old question: is thyroid imbalance the cause of your weight gain or inability to lose weight? We know that driving a car without gas in the tank is futile. Sure, you may last on fumes for a few miles, but in the end it will be very difficult to get to your destination. Your thyroid is no different when it comes to weight loss. According to the Canadian Thyroid Association, an estimated that 200 million people in the world have some form of thyroid disease. Recent studies indicate that 30% – over 10 million people – suffer from a thyroid condition of one type or another. That means one in every three Canadians has a thyroid disorder, and of those, as many as 50% are undiagnosed. Thyroid hormones regulate our metabolism and organ function. They directly affect heart rate, cholesterol levels, body weight, energy, muscle contraction and relaxation, skin and hair texture, bowel function, fertility, menstrual regularity, memory, mood and other bodily functions. Without enough thyroid hormone, every system in the body slows down. Those who suffer from hypothyroidism feel tired and tend to sleep a lot. Their digestion is slow and weight gain typically occurs. They can also experience extremely dry skin, hair loss, even slower mental processes. In fact, without enough thyroid hormone, attaining your perfect weight is almost impossible. What’s really slowing your thyroid down? The thyroid may fail to produce enough thyroid hormone as a result of an autoimmune response against the thyroid (Hashimoto’s thyroiditis) or other problems with the function of the thyroid gland itself. Toxic levels of mercury, typically resulting from mercury fillings in the mouth or consuming large amounts of mercury-laden ocean fish, may inhibit thyroid gland function. High levels of estrogen or a converse deficiency of progesterone inhibits thyroid function. Many menopausal women using estrogen replacement therapy may develop the symptoms of an underactive thyroid. 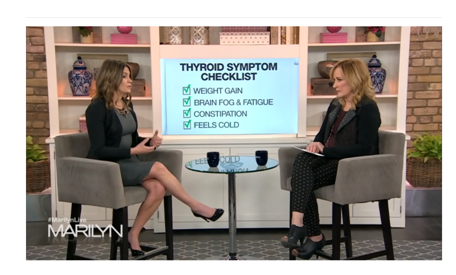 Menopausal women who are already taking medication for hypothyroidism may also need to increase their dosage if they choose to use hormone-replacement therapy (HRT). High levels of stress hormone cortisol may prevent the activity of thyroid hormone in the body. It also prevents the conversion of thyroid hormone from the inactive (T4) form to active (T3) form. The excess consumption of soy-based foods and beverages may decrease the activity of thyroid hormone in the body. Nutritional deficiencies may prevent the proper manufacture or function of thyroid hormone in the body. For example, iodine and tyrosine are necessary for the formation of thyroid hormone, while selenium is necessary for the normal function of thyroid hormone. Many individuals with decreased thyroid hormone levels also have a zinc deficiency.